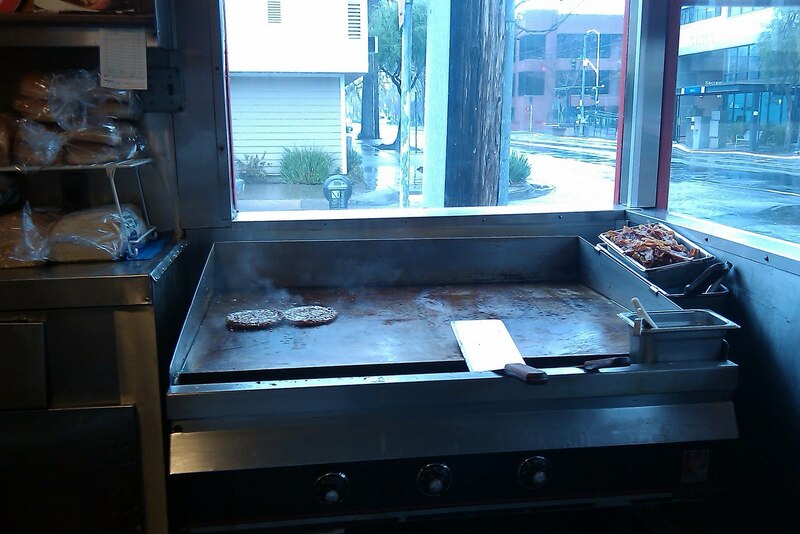 When I first started working in Downtown Sacramento, I frequented Jim-Denny’s Hamburgers at least once a month. In recent years, however, I only visit the place a few times a year. The quality has gone down over the years. 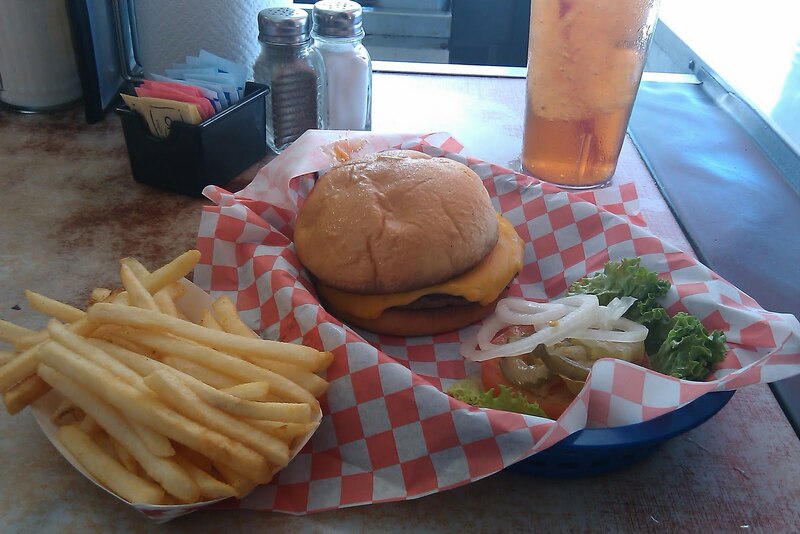 Still, it is a good place to get a burger, fries, and a drink for only around ten bucks. Some people might say the Jim-Denny’s of the last six years is a calmer place and more conduciv e to digestion, but I loved the old days—it fit right in with all the warm and fuzzy signs on the wall like “Our Customer Complaint Representative’s name is Helen Wait. If you have a complaint, go to Helen Wait!” This in contrast to a relatively new sign which reads “Enter as Strangers ~ Leave as Friends.” The old lady at the grill was the show, however. It was kind of like a greasy-spoon version of Benihana. On one occasion, a man picked up his to-go order and left. He came back in a minute and stated that he didn’t order cheese on his burger. The lady didn’t even turn around. She kept flipping burgers and said, “Oh well, we’ll get it right next time.” We all had a little chuckle at the poor guy’s expense, but we had no illusions that she would would treat us any different if our order got messed up. On another occasion, I was sitting on the far end of the counter next to a wall-mounted payphone. On the counter below there was an order pad and a pen. This was the phone that customers called to order food for pickup. What I did not know was that customers occasionally took the orders. So when the phone rang a couple of times the old lady shot me a look and said, “Well, pick it up!” I did as I was told and took the order! Part of the charm of Jim-Denny’s is that it is old—about 75 years. You can still see what appears to be the original prices for items on the woodwork on the wall like “Fancy C ube Steak 25 cents.” The ownership and staff have changed over the years. None of the people I remember ten or fifteen years ago are here. Gone is the loud grill mistress, slow moving grandpa in the back, even the guy, who looked like a street person who delivered sodas and burgers in baskets with shaking hands. They are now replaced with more professional, less entertaining tattooed personnel. 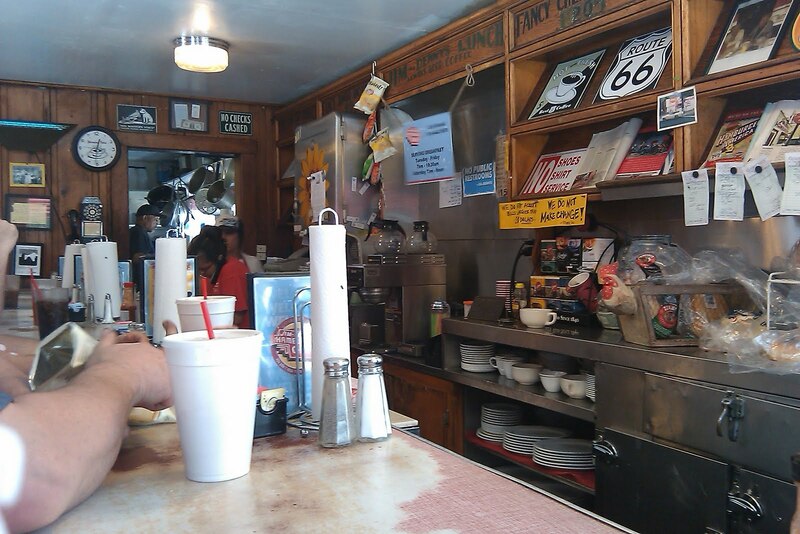 The charm has all but disappeared, only the cramped counter and 75 year-old trappings endure, which is good enough for me to pay occasional visits. Today I am had a Double Burger. I ordered it with Cheddar cheese and raw (white) onions. The beef tastes good thanks to Jim-Denny’s well-seasoned grill and the fact that the restaurant uses fresh, pre-for med patties. Everything else is good, but there is nothing extraordinary. Not even red rather than plain white onions. The fixings are fresh and a decent, if not great, bun. Jim-Denny’s serves their fixing on the side which is a blessing to the picky, but I find it a hassle: I’m not an expo chief, I’m the guy who ordered that stuff on the burger! The fries are very good–crispy and light. I do not know why I like eating in a cramped place like this. Maybe it reminds me of the old Squeeze Inn. Jim-Denny’s is not in that league, but I still do not mind knocking elbows with strangers during a busy lunchtime. The food is tasty and the atmosphere cozy. 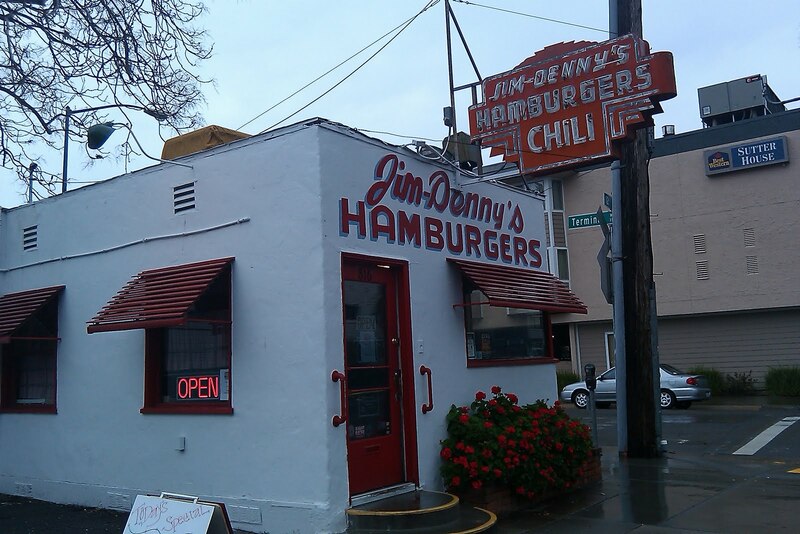 One final note, Jim-Denny’s has the distinction of being one of only 150 hamburger spots featured in George Motz’s book Hamburger America (Running Press; Revised/Updated edition; May 10, 2011). I think the 75-year old landmark deserves to be in the book but why the Squeeze Inn and Scott’s Burger Shack didn’t also make it is a mystery to me. I received this wonderful poster of, what I believe to be, three Vespa Second Series 125s as a Birthday gift a couple of months back. Thanks Mom!